Both teams fought long and hard in the the 10th annual Heroes Hat game, but in the end it was a result that neither of these fierce and hated rivals wanted: a tie. The regular season finale between Quinnipiac (17-11-6, 9-8-5 ECAC) and Yale ended with the score 2-2, which was just the second time in the 13-game history between these programs that a winner was not decided. Yale retains the Heroes Hat with the tie because of last year’s 6-1 rout of the Bobcats. Quinnipiac is now 7-5-2 all-time against Yale. Quinnipiac head coach Rand Pecknold wasn’t pleased with tying Yale, but as the regular season has come to end, it is all about earning points. “We’re certainly not ecstatic with tying tonight, but it’s better than losing,” Pecknold said. His players had similar feelings. Both teams came out aggressive, but neither team could capitalize in the first period. It was the second period that was the story of the game. The Bobcats were looking to capitalize on the rest of their power play that carried over from the first period, after Yale’s Jesse Root was called for tripping with 1:38 left in the period. The Bobcats could not find any success in the waning moments and the Bulldogs would eventually kill off the remaining 20 seconds. As soon as Quinnipiac’s man-advantage ended, Yale broke through. After the Yale (13-13-3, 10-10-2 ECAC) penalty kill successfully denied the Bobcats any chances, the Bulldogs drew first blood. Jesse Root raced out of the penalty box and received a cross ice pass from Charles Brockett. Root skated through the slot driving his way towards the net on a breakaway and deked left on Quinnipiac goaltender Eric Hartzell before depositing a back-hander top shelf for a 1-0 lead just 29 seconds into the second period. With just over 11 minutes remaining in the period, the Bobcats would finally capitalize on their power play. Yale’s Kenny Agostino was called for roughing after lowering his shoulder on Mike Dalhuisen behind the Bobcats goal. The Peca-Jones-Jones line then stepped up at the right time. Peca circled in the slot to Connor Jones down low who hit Loren Barron with a pass through the slot. Barron one-timed a shot from just inside the right wing circle beating Yale goaltender Nick Maricic, over his left shoulder. Moments later, Yale countered on a shorthanded breakaway as Root scored his second of the game. Hartzell stopped the initial shot by Clinton Bourbonais but Root corralled the rebound in front of the doorstep and lifted the puck in the net. At 9:51 of the second period, things got chippy as Yale’s Antoine Laganiere received a game misconduct penalty for contact to the head on Zack Currie. This resulted in a five minute major power play for the Bobcats. Looking to attack Yale with the man advantage the Jones twins came through. With just about two minutes remaining on the five minute major it was the puck handling ability of Peca to find Kellen Jones down low on the left wing, who sent an across ice pass to Connor and blasted a shot into the open net to tie the game at two. Quinnipiac had a chance in the third period with 5:45 left as Yale received a penalty for cross-checking. 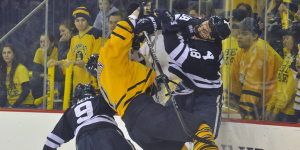 A minor fight ensued as Yale’s Kevin Lambert was called for charging near the penalty box. Matching roughing penalties were then called as Cory Hibbeler retaliated, against Brockett. However, with this great opportunity, the Bobcats did not muster any great chances. Quinnipiac outshot Yale 15-7 in the final period and overtime but couldn’t manage to go ahead. Quinnipiac was 2 fot 6 on the power play while Yale was 0-for-3 for the game. In order to advance far into the ECAC playoffs, the Bobcats know they must bring their complete game and not be lackluster in any areas or else they will be sent packing.